Sometimes, you reach the threshold of your adulting capacity. I hit it on Thursday night. All week long, I had adulted like a champion. I woke early to exercise. I taught my classes and graded 26 essays and 22 speeches. I kept three children alive, fed, and homeworked. I came up with creative strategies for Halloween costume malfunctions. I served vegetables with dinner. My crash occurred on Thursday evening when I announced to my children that they'd be in charge of making dinner. They looked at me as if I had spoken in Serbo-Croation, and I, borrowing my father's strategy for communicating with non-native English speakers, repeated myself more slowly and loudly: "I am unable to function. You will be responsible for preparing and cleaning up dinner tonight." Twenty minutes later my oldest daughter handed me a plate with a slice of lunch meat, half of a rolled up tortilla, and a small scoop of mashed avocado that had been heavily salted and squirted with lime juice. "We made guacamole, but our recipe didn't go very far," she said. I ate, dropped my plate into the crowd of dirty dishes in the sink, and then retreated to my bedroom to avoid listening to my kids argue over the division of cleaning responsibilities. 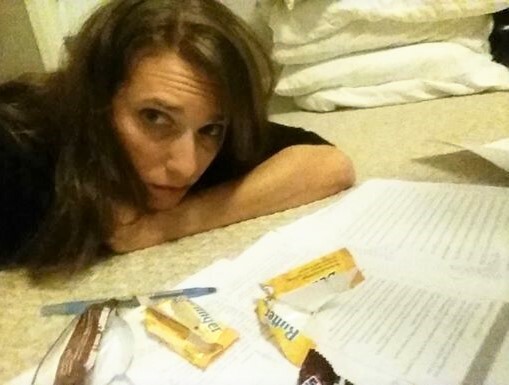 I didn't even make it onto my bed; I sank straight to the floor, where I spent the next two hours eating chocolate and grading more essays. Of course, the funny thing about adulthood is that even if you fail at it one day, you get the chance to do it again the next, hopefully a little better. And if that next day is equally trying, adulthood will still be waiting for you around the corner on the following day, too. It's persistent like that. Some days were just meant for survival, and eating chocolate, and lying despondently on your bedroom floor. We live to adult another day.